Leave Camerons Cottage on your Loch Ness tour and turn left onto the B852 towards Whitebridge. Travel for about 2 miles on a twisting single-track road to the T-junction and turn right onto the B862. You are now on the road heading towards Fort Augustus and on the site of the original road built by General Wade linking Inverness to Fort Augustus. General Wade was appointed by the government of King George l ‘Commander in Chief of His Majesty’s Forces, Castle, Forts and Barracks in Northern Britain’ in order to confirm the facts surrounding the Highlanders way of life and hopefully to establish harmony. His grand strategy was to build strong well-sited forts arranged so as to intercept the lines of rebel communication and movement. He was given full authority to build the new forts at Inverness and Fort Augustus. Wade was a man of many parts. As an engineer he designed many of the Great Glen roads and bridges which can still be seen standing today. Wade was sent to Scotland in 1724 and at once began to build his first Inverness to Fort Augustus road near this South side of the loch. 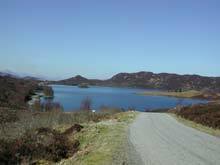 He was not satisfied with his original lengthy route and laid another more direct road in 1732 nearer the lochside. This original road from Foyers to Fort Augustus is now overlaid by the modern B862. Passing the small hamlet of Whitebridge the original arched White Bridge built by Wade can still be seen today. The Whitebridge Hotel is a long established highland Hotel and was built in 1899 on the site of an old King's House which was destroyed by fire some years before. A King's House was a hostelry used by the soldiers while in a specific area and this King's House was used by the soldiers of General Wade while they were stationed in the Highlands building roads and bridges. Carry on climbing up the single track road passing heather moorland and grasslands where herds of stags and hinds are frequently spotted roaming freely along with numerous hardy sheep. There is a splendid view point with parking bays at the very top at a height of 1162 ft. On a clear day, looking back the way you came, you can see the four lochs-Lochs Mhor, Ruthven, Duntelchaig and Ashie and then east to the Monadhliath Mountains. Ahead of you on a clear day you can view the snow covered Nevis Range with the high peak of Ben Nevis at 4406 ft in the distance. Ben Nevis is the highest mountain in the British Isles. Start the descent down the mountains driving alongside picturesque Loch Tarff with snow capped mountains in the distance. This is the loch featured in the opening frames of the film 'Local Hero'. Between Loch Tarff and Fort Augustus there is a parking bay on the left affording great views over Fort Augustus and the Abbey. The Fort was completed in 1730 and named after William Augustus the younger son of George ll. Today almost nothing remains of the original military ‘Fort’ although parts of it were incorporated into the Benedictine Abbey and School which was built in 1876 on this site when the military buildings were gifted to the Order of St. Benedict by Lord Lovat. The community of Benedictine monks were unable to sustain themselves and left in 1998. The recently redeveloped site now provides self catering holiday accommodation and residential apartments. Just before entering Fort Augustus it is well worth stopping for the panoramic view of Loch Ness looking north-east towards Inverness. Pass the imposing white building of The Lovat Arms Hotel up on your left and the entrance to the old Abbey on your right and turn right onto the A82. Drive over the Caledonian Canal via the swing bridge and park either by the side of the canal or drive on and park in the car park on the left just after the petrol station. There are lots of good photo opportunities in the village and it is well worth a walk along the side of the Caledonian Canal watching the various boating craft in the lock gates waiting to go on their way. 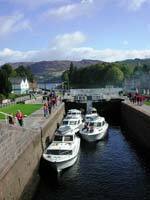 The Caledonian Canal was designed by engineer Thomas Telford and connects the east coast at Inverness with the west coast at Corpach near Fort William. The canal runs some 62 miles from northeast to southwest. Only one third of the entire length is man-made, the rest being formed by Loch Ness, Loch Oich, and Loch Lochy. It was built between 1803 and 1822 but was never a great commercial success as the canal was originally built too shallow and suffered from poor construction in places. Most traffic still continued to use the more treacherous northern sea route via the Pentland Firth. It was not deepened until 1847 by which time most ships were too large and Inverness was soon connected to the Lowlands by railway. The canal is now mainly used by pleasure craft. There is a regular 1 hour boat trip onto Loch Ness from Fort Augustus on The Royal Scot equipped with sonar for an interesting glimpse of life under the water. When you cross the stone bridge over the River Oich take a look up river to see the remains of an old railway viaduct. This was part of the Fort William to Fort Augustus railway which only stayed open for 12 years as it lost so much money that it had to be abandoned. Not long after leaving Fort Augustus you will glimpse the only island in Loch Ness, a rocky tree clad outcrop called Cherry Island. It is a man made isolated construction of stone and oak wood known as a crannog. These were built to provide ancient fortified refuges from wild animals and unwelcome invaders. Carry on the A82 through the village of Invermoriston and notice the stone bridge set upstream from the main road which was constructed by Thomas Telford in 1813 and still stands firm today. A little further along is the John Cobb memorial cairn. This was constructed by the local people in 1953 to commemorate his memory. On 29th September 1952 John Cobb attained a new world water speed record of 206mph over a measured mile on Loch Ness in his power boat ‘Crusader’. Unfortunately the boat hit a rough patch of water causing it to disintegrate quite spectacularly. A rescue boat retrieved his body and although he was barely alive he died very soon afterwards on the shore of the loch at the place where the memorial now stands. 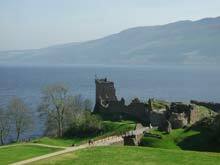 Continue on your journey passing on your right the magnificent ruins of Urquhart Castle built on a rocky peninsula and commanding a spectacular view over Loch Ness. It still remains an impressive stronghold despite its ruinous state. Once one of Scotland’s largest castles, Urquhart’s standing remains include a tower house that commands splendid views of Loch Ness and the Great Glen. It is steeped in history and conflict and the story is unfolded dramatically in the new visitors centre which was built in 2002 sympathetically into the hillside. Turn into the car park area to visit the castle and for great photo opportunities. You do have to pay to stay. From the castle it is a short journey into the sprawling village of Drumnadrochit. Here it is well worth visiting the ‘Loch Ness Exhibition Centre’ which takes visitors through 500 million years of Loch Ness history using a highly effective mix of lasers, digital projection and special effects. It charts the history of the monster by exploring Scotland's geological past, its folklore and the various serious research projects carried out on the loch. From Drumnadrochit carry on the A82 towards Inverness passing on the left The Clansman Hotel. Looking across from this point you can clearly see the village of Dores on the opposite shore. Soon you will pass a small village aptly named Loch End. Loch Ness now finishes and the River Ness and the Caledonian Canal come into their own. The road runs alongside the canal into the city of Inverness, the Capital of the Highlands and Europe’s fastest growing city. On entering the centre of Inverness you cross a bridge over the River Ness. Keep to the right hand lane and carry straight on after the bridge up towards the city centre passing The Town House on your right. Here the road bears right and up towards Inverness Castle. The red stone Inverness Castle you see today was built in the 1830s to house courts and administrative buildings. Its arrival was part of a boom in the 1800s that saw Inverness truly establish itself as the Capital of the Highlands. Although the Caledonian Canal may never have been such a huge commercial success it did add to the importance of the town and to its already thriving harbour. By the 1870’s railways were in place and today Inverness enjoys good rail links to every point of the compass – north to the Caithness towns of Thurso and Wick, west on the famous scenic route to Kyle of Lochalsh and the Isle of Skye, east to Nairn and Aberdeen, south via Aviemore to Glasgow, Edinburgh and London. You of course may wish to stop and spend time in Inverness. As in all cities parking is always a problem but there are pay & display parking spaces alongside the river and a car park next to the cathedral. There are plenty of individual shops in the precincted area as well as the larger Eastgate Shopping Centre. Journey on out of Inverness looking for the B862 signposted to Dores and carry on this road out of the city towards Loch Ness. The first sighting of Loch Ness surrounded by mountains is always breath-taking. There are outstanding views down the loch with the dome shaped peak of Mealfuarvonie on the right, the highest mountain around the loch, rising up in the distance and often covered in snow in the winter months. At the village of Dores the road forks left and right - take the lower right Loch side B852 road. However you may wish to pull in at The Dores Inn for refreshments and have a leisurely relaxing walk along the crescent shaped Dores beach. From Dores take the lower road, the B852, back to Camerons Cottage. It is about 8 miles and there are a number of parking bays on the loch side allowing you to stop and get photos of Urquhart Castle and the bay on the opposite shore. Pass through the small hamlet of Inverfarigaig and on towards Foyers. Pass the Boleskine graveyard on your right, the burial ground of the Fraser Clan. The graveyard marks the site of a pre 1777 Church of Boleskine Parish though nothing obvious remains today. The small stone building in the grounds is a mort-house where a guard was stationed to ensure the safety of the coffined bodies in the days when grave robbing was a real fear. Further up the hill on the left is the large Private residence of Boleskine House which was built in the late 18th Century as a hunting lodge by the Honorable Archibald Fraser and has an interesting history. Onwards to the village of Foyers which was once an important staging post on the old military road from Inverness to Fort Augustus. It was also the first village in the Highlands to have electricity in each house powered by the British Aluminium Company. This company was the first to harness hydro-electric power in Scotland and built a smelting plant at Foyers and powered the plant using hydro-electric power from the waters of the Falls of Foyers. The plant opened in 1896 and whole families worked at the facility for generations. During both world wars the plant employed about 500 people and every house in the village was lit by electricity, while Buckingham Palace and the rest of London was still using gas. Aluminium production at Foyers ceased in 1967 but in 1973 the power generation equipment was enlarged and upgraded and the ex-aluminium plant now serves as a hydro electric power station feeding the national grid. 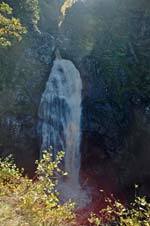 It is worth stopping here to walk down to see the spectacular waterfall, the Falls of Foyers. Park in the car park next to the shop and directly opposite is the gated entrance on the left leading down to the upper and lower Falls. There are various safe stepped walkways leading steeply down through the forest and well organised fenced view points allowing for good photo opportunities to see the 140 ft waterfall plunging into a bubbling steaming mass below. This is where the River Foyers drops dramatically 100 feet into a deep gorge and flows rapidly into Loch Ness. Drive through Foyers and back to Camerons Cottage.